Home > About whales & dolphins > What is baleen? There are 14 species of baleen whale including the blue, bowhead, right, humpback, minke and grey whale. Baleen whales are generally larger than toothed whales except for the sperm whale which is very big and has teeth. Many baleen whales migrate annually, travelling long distances between cold water feeding areas and warm water breeding areas. All baleen whales have baleen instead of teeth which they use to collect shrimp-like krill, plankton and small fish from the sea. These bristly baleen plates filter, sift, sieve or trap the whales’ favourite prey from seawater inside their mouths. Baleen is made out of keratin, the same protein that makes up our fingernails and hair. The baleen of the bowhead whale can be be 4 metres long. Baleen whales are grouped into four families and they range in size from the blue whale which can grow up to 33m (108ft) long, to the pygmy right whale, which is 6.5m (21.33ft) long. 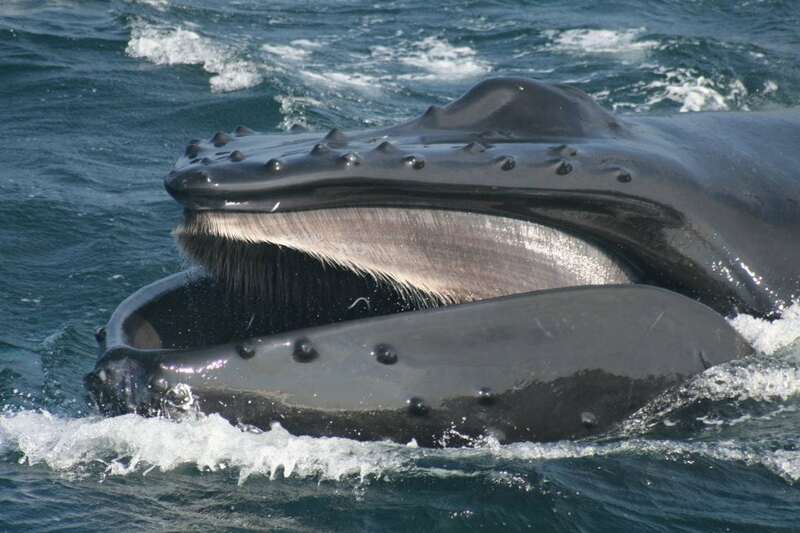 Baleen whales have two blowholes (nostrils) on the top of the head and so their blows are bushier than those of toothed whales who have a single blowhole. Some baleen whales including the humpback, minke, fin and blue, have clearly visible throat grooves which allow their mouths and throats to expand and balloon out as they gulp monstrous-sized mouthfuls of seawater and food. Baleen whales evolved from toothed whale ancestors. The number, size and colour of the baleen plates are unique for each whale species.